Of all elementary, middle and high school students in South Korea, 1.8 percent of have been deemed gifted children and are receiving specialized education, the Education Ministry said Wednesday. Of 110,053 gifted children nationwide, 81.2 percent of them are receiving specialized education in the fields of mathematics and science, the ministry said. Others included invention (4.0 percent), humanities and social sciences (3.5 percent), information-related studies (2.9 percent) and various foreign languages (2.3 percent). 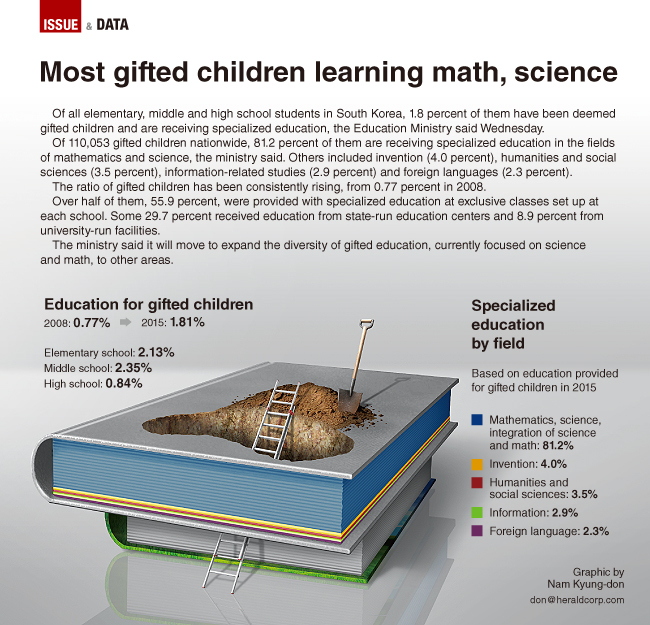 The ratio of gifted children has been consistently rising, from 0.77 percent in 2008. Over half of them, 55.9 percent, were provided with specialized education at exclusive classes set up at each school. Some 29.7 percent received the education from state-run education centers and 8.9 percent from university-run facilities. The ministry said it will move to expand the diversity of gifted education currently focused on science and math to other areas.